Note: Readers may have noticed my mistake yesterday of referencing a female figure in the trailer, where I meant to reference the one in the concept art – I sincerely apologize for the mistake, and it has been fixed. Posted earlier today on the website of none other than Official Nintendo Magazine, is a new interview with Eiji Aonuma. These interviews are met with great joy from some and absolute terror from others. Regardless of their personal reaction, the gaming community is all ears. Unfortunately, we didn’t get much new insight into the game from this particular interview, but there are certainly a few highlights. Firstly, it has been definitively confirmed that the feminine figure in the concept art is not going to be Zelda. 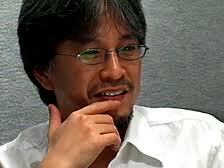 Aonuma was keen on not revealing the identity, but he did confirm this singular fact. Second, in a move that may upset many longtime fans of the series, but may excite others, Aonuma has said that the development team is “reimagining some of the traditional gameplay elements. ” To elaborate, this basically means that the game will still have the traditional over-world and dungeon themes we are all intimately familiar with, but some integral things (and he never makes it quite clear what these things specifically will be) are to be altered. Oh, and for all you timeline fanatics out there: it has been confirmed that Skyward Sword’s position in the timeline is before Ocarina of Time – though there was no elaboration on this point in the interview. For more information on Aonuma’s plans for the 3DS remake of Ocarina of Time, and also some personal information about the man behind the curtain, be sure to check the source.